The food fortifying agents market is projected to reach USD 69.8 Billion by 2020 growing at a CAGR of 16.7% from 2015 to 2020. The food fortifying agents market is segmented on the basis of type into minerals, vitamins, lipids, carbohydrates, proteins & amino acids, prebiotics, probiotics, and others. On the basis of application, it is segmented into cereals & cereal-based products, dairy & dairy-based products, fats & oils, bulk food items, beverages, infant formula, dietary supplements, and others. 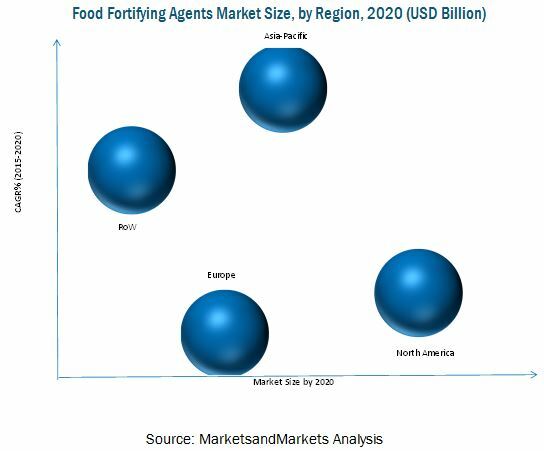 The food fortifying agents market is also segmented on the basis of region into North America, Europe, Asia-Pacific, and the Rest of the World (RoW). With the increasing health-consciousness among the consumers and multi-benefits of food fortifying agents, the demand for food fortifying agents is expected to enhance the market growth from 2015 to 2020. These factors have led to the adoption of the food fortifying agents in various food & beverages, pharmaceuticals, and pet food manufacturing industries, among others. The vitamin segment accounted for the largest share of the food fortifying agents market in terms of value, during the forecast period, due to the increasing incidence of diseases out of vitamin deficiency such as rickets and osteoporosis, increasing healthcare cost, and growing aging population. The base year considered for this report is 2014 and the forecast period is from 2015 to 2020. This report includes estimations of market sizes for value (USD Million) and volume (kilo tons). Both, top-down and bottom-up approaches have been used to estimate and validate the size of the global food fortifying agents market. This research study involves the extensive usage of secondary sources to identify and collect information useful for this technical, market-oriented, and commercial study of the technical enzymes market. The primary sources are mainly several industry experts from core and related industries and preferred suppliers, manufacturers, and distributors. In-depth interviews have been conducted with various primary respondents, including key industry participants, subject matter experts (SMEs), C-level executives of key market players, and industry consultants among other experts to obtain and verify critical qualitative and quantitative information as well as to assess future prospects. Key participants in the supply chain of food fortifying agents are raw material suppliers, government bodies, distributors, and end users such as the food, beverage, and pharmaceutical industries. The key players involved in food fortifying agents market include Cargill, Incorporated (U.S.), Royal DSM (The Netherlands), CHR. Hansen Holdings A/S (Denmark), E. I. du Pont de Nemours and Company (U.S.), BASF SE (Germany), Arla Foods (Denmark), Tate & Lyle (U.K.), Ingredion (U.S.), The Archer Daniels Midland Company (U.S.), and Nestle SA (Switzerland). The market for food fortifying agents is projected to reach ~USD 69.8 Billion by 2020, at a CAGR of about 16.7% from 2015 to 2020. The global market is fueled by the growing health awareness among consumers and the increasing incidences of chronic conditions such as blood pressure, diabetes, cardiovascular diseases, and cancer. Globally, the rise in aging populations and the growing health concerns have led to a large-scale adoption of food fortifying agents for various applications. The food fortifying agents market is segmented on the basis of type into minerals, vitamins, lipids, carbohydrates, proteins & amino acids, prebiotics, and probiotics. The probiotics segment is growing at the fastest rate in terms of value, due to the increasing consumers’ demand for essential nutrients owing to the growing incidences of chronic diseases. Based on applications, the market is segmented into cereals & cereal-based products, dairy & dairy-based products, fats & oils, bulk food items, beverages, infant formula, and dietary supplements. The dietary supplements segment, by application, is growing at the fastest rate due to its benefits in the overall development of the human body and health benefits attached to it. Bulk food items dominated the food fortifying agents market due to the increasing demand for high-quality food products and changing health trends, which in turn increases the demand for food fortifying agents. The market is also segmented on the basis of region into North America, Europe, Asia-Pacific, and the Rest of the World (RoW). North America dominated the global market due to the developed food processing industry in this region. Asia-Pacific is the fastest growing region in the food fortifying agents market due to continuous increase in demand for food fortifying agents owing to the health benefits from different nutrients. The multi-functionality of food fortifying agents, coupled with the growing demand from the food & beverage industry, drives the market. However, increasing raw material cost and competition among raw material suppliers along with regulations regulating the production of use of food fortifying agents are restraining the market. This market is fragmented and competitive, with a large number of players operating at regional and local levels. The key players in the market adopted new product launches as their preferred growth strategy. Key players such as Cargill, Incorporated (U.S.), Royal DSM (The Netherlands), CHR. Hansen Holdings A/S (Denmark), E. I. du Pont de Nemours and Company (U.S.), BASF SE (Germany), Arla Foods (Denmark), Tate & Lyle (U.K.), Ingredion (U.S.), The Archer Daniels Midland Company (U.S.), and Nestle SA (Switzerland) have been profiled in the report.